I am a sucker for rotting flesh. And while Cole Sear of The Sixth Sense might not have been thrilled about seeing dead people, I rather enjoy them. That is – when they’re zombies – of the entertainment kind. In truth, I’ve not always been a fan – in fact as a kid, I avoided most all of the classic horror flicks because if I dared to watch one, I’d be up all night with the lights on. But when my husband introduced me and my children to The Walking Dead during the summer of 2013, we binge-watched three seasons in order to be ready for season four that October. Suffice it to say, I was hooked. 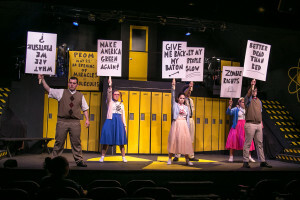 So when we learned that TheatreWorks New Milford was staging the musical Zombie Prom, with book and lyrics by John Dempsey and music by Dana P. Rowe (based on a story by Dempsey and Hugh M. Murphy) I was intrigued to say the least. 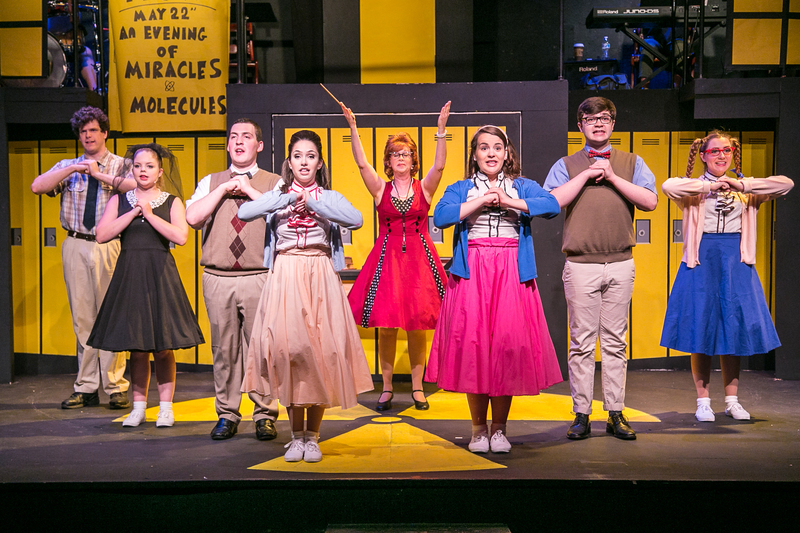 While this ain’t exactly Rydell High, it is indeed something of a fusion of Grease and the 2013 flick Warm Bodies – except it came before the latter, premiering in 1993 then going Off-Broadway in 1996. Set in the fifties at Enrico Fermi High – yes, Fermi, the creator of the world’s first nuclear reactor – requisite bad boy (Jonny without the “h”) meets sweet girl (Toffee). Girl falls for boy. Boy wants to be a better boy. Sure sounds very Danny and Sandy, doesn’t it? But this boy doesn’t letter on the track team or lead the T-Birds (although he does don a leather jacket); rather he possibly very intentionally takes his motorcycle a bit too close to the local nuclear power plant. And from that point on, well, you’ll just have to see it to find out what happens next. Suffice it to say, it’s quite electrifying! Toffee is joined by her girls – Candy, Coco, and Ginger. Jonny on the other hand didn’t quite have enough time to bond with the boys, Joey, Josh, and Jake, but he did make an impression before his untimely demise, and then again when revisiting the school halls a new and rather emerald-y, sage-y, olive-y green (check it out, those are names of actual shades). And while these cool kids would love to actually rule the school, it’s Principal Delilah Strict who’s ready to dole out the discipline with her trusty ruler – and she’s got it bad for the bad boy. But not the one you might think – it’s actually her old flame Eddie Flagrante, an investigative reporter who’s ready to find the dirt on Jonny, or at least the nuclear waste he’s covered in. With a truly stellar cast and directed by the very talented Matt Austin (who also capably stood in as Jake the night we attended) as well as some truly fun choreography by Jenny Schuck, Zombie Prom will have you rocking the rockabilly all night. Jody Bayer as Strict is phenomenal. Not only does she have a great voice, but she has wonderful comedic timing. Lexi Tobin is a delightful Toffee, the vulnerable doll who’s hopelessly in love with her Jonny, played by a terrific Tommy Ovitt. Stephen DiRocco is excellent as the opportunistic Exposé Magazine reporter and equally smitten Flagrante. The girls, Sydney Coelho as Candy, Dana Wilton as Coco, and Erin Shaughnessy as Ginger; and the boys, Richard Frey as Joey and Karl Hinger as Josh (in future shows, an injured Dominick Ventrella resumed his role as Jake), were a spectacularly funny and cohesive ensemble – and at different times many of them doubled for secondary characters. Whether geek or jock, nerdy or annoying, the entire group of high schoolers and the actors portraying them looked as if they were having a blast from curtain up to the final bows. The two-tiered set was superb with a span of brightly colored lockers which served to bring back just a touch of my old high school agita (thanks TheatreWorks!). A big shout out to Austin for sound and scenic design along with his construction, painting, and dressing team. Kudos to Anna De Masi as Musical Director; Meg Jones as Costume Designer; Peter Petrino as Lighting Designer; and all of the rest of the production staff for their spot-on contributions. The musical accompaniment provided all the right support for both the talent and any chair dancers in the audience – a hand to the band: De Masi, piano; Tom Kean, guitar; Jeff Morro, Bass; and Bob Kogut, drums. This campy confection is enthusiasm plus energy multiplied by fun (a little high school math for you – or would that be physics?) – and it’s escapist entertainment of the first order. Come see Jonny in all his vivid color(s) and don’t forget your lunch money. Okay, on that last one, you can use it instead for a glass of wine and snacks before the show! Zombies are like bad pennies, they turn up everywhere, but this is especially true for cinematic ones. Ever since Bela Lugosi’s 1932 film, White Zombie, the walking dead (including the hit AMC TV show of the same name) have been a staple in theatrical movies and television programs. There aren’t many zombie plays, however – at least not many that are performed on a regular basis around the country. Don’t get me wrong, in my long career as a theatregoer, I’ve seen a lot of zombies on stage – but they weren’t walking dead kind. 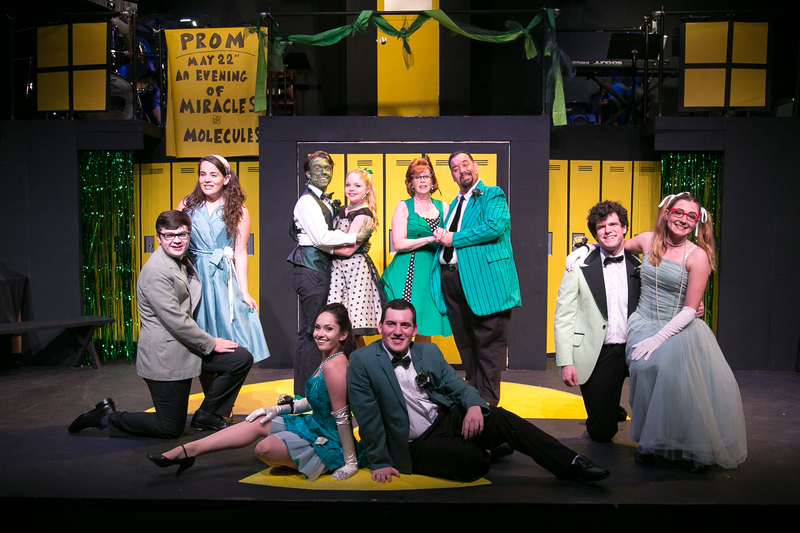 Fortunately, TheatreWorks New Milford’s Zombie Prom is a true musical play about zombies that is rich, vibrant, campy and thoroughly enjoyable. Think Romeo and Juliet meets Little Shop of Horrors meets George Romero’s Night of the Living Dead. Indeed, the play, which takes place in the late fifties, harkens back to some of the spoofs that were done cinematically around that time including classic, The Blob, with a young Steve McQueen, Abbott and Costello Meet the Mummy, and one of my favorite guilty pleasures that even beats the twisted genius of Ed Wood, Invasion of the Saucer Men. Zombie Prom has a real Happy Days feel to it, complete with a Fonzie-like, James Dean wannabe character (liveried in leather) in bad boy Jonny (without an “h”). Unrequited love and not being able to fit in takes him on a suicide run on his “sickle” (as Eric Von Zipper played by Harvey Lembeck called motorcycles in the 60s beach party movies ). 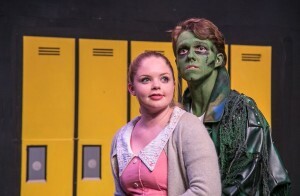 Except that he runs into a vat of nuclear waste and, instead of dying, comes back as a zombie who, despite being greener than Kermit the Frog, wins back his girlfriend and, of course, is a big hit at the prom. Director Matt Austin, who is a veteran comic actor himself and whom Pillow Talking has enjoyed in other productions, has assembled a multi-talented cast to successfully pull this off. (He showed his acting chops in Zombie Prom as well when he had to step in at the last minute for one of the actors because of an accident.) Tommy Ovitt who plays Jonny is a true quadruple threat. Not only can he act, sing and dance, but he plays one hell of an animated (or should I say re-animated) dead guy. He is even charismatic and charming with hollowed out eyes and green makeup. Jody Bayer is simply priceless as Miss Delilah Strict and proves to be a quadruple threat as well: acting, singing, dancing, and showing off her black undergarments. Her comic timing is impeccable. Stephen DiRocco is a real gem as Eddie Flagrante (I love the name – symbolism so powerful you can drive a stake through its heart – oh, sorry, that’s for vampires not zombies.) Lexi Tobin channels the innocence and vulnerability of Sandra Dee as Jonny’s to-die-for love. She also shows her singing chops in most of the musical numbers, especially “The Voice in the Ocean.” Props must go to the rest of this wonderful cast including Sydney Coelho (Candy), Erin Shaugnessy (Ginger), Dana Wilton (Coco), Richard Frey (Joey), and Karl Hinger (Josh). My bad for sometimes not recognizing individually all of the people that contribute to a show like Zombie Prom. Time and spatial limitations just prevent me from doing so, but I must give a special shout to the band who captured the essence of 50s rock music: Anna De Masi (Piano), Tom Kean (Guitar), Jeff Moro (Bass), and Bob Kogut (Drums). I don’t know who did the zombie make-up, but it was a great job – I could just imagine what a pain in the neck (literally) it was to scrub off after every performance. So if you want to kick back and enjoy some great escapist entertainment, see Zombie Prom. You’ll die laughing (pun intended). Stephanie is a journalist, writer, editor, and has had several hundred articles published in various newspapers and magazines, many of which still are available online under “Stephanie Lyons Schultz”. She has a Masters degree in Counseling Psychology and was a practicing psychotherapist. She currently is a professor of psychology at WCSU and NVCC in Connecticut. Wayne is an Emmy-Award winning writer, producer, and director. 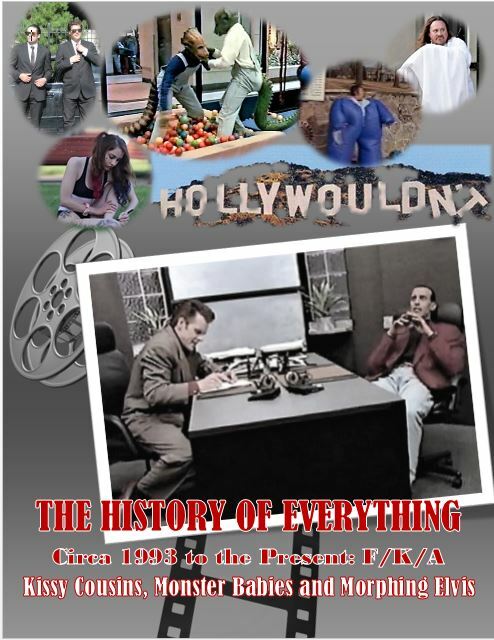 He has produced many programs and documentaries that have appeared on television, and have been distributed to schools, libraries, and home video. Wayne also is a practicing attorney with a Masters degree in Law from NYU. In addition, he is a professor of communications at WCSU. Together, this recently wed couple write, produce, and direct as many of their stage, screen, and TV projects as they can with a full house -- their combined brood of seven! 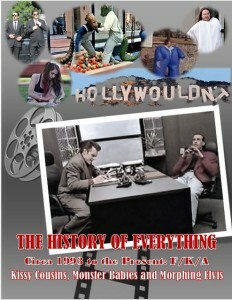 Some of their work has been featured this summer and fall off off Broadway; other work currently is under option. They hope to continue to promote more of their projects in the coming months! Feel free to write whatever comments you like! We want your feedback!